Somehow I have my Whisk Wednesdays weekly recipes all mixed up. Last week I was so busy with work and Easter prep I totally forgot to post my WW dish which was Frog Legs! I honestly did not even think about it until Saturday and with Easter being the following day, I did not have time to write up the post. The Frog Legs were wonderful and I will post that recipe another day. 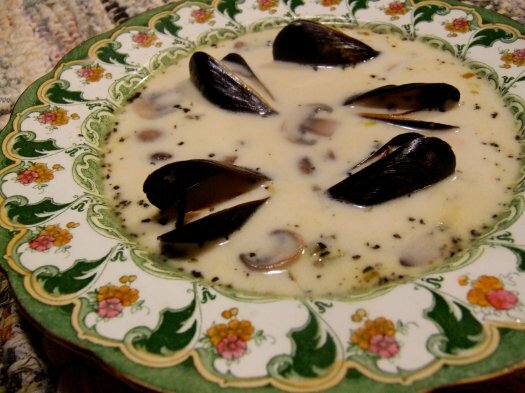 I decided to do a recipe rewind for next weeks Whisk Wednesday dish with the Billy Bi, Mussel Soup, but I jumped ahead of myself and made it this week instead. Is this getting confusing? Eventually it will all work out, it's just that I'm a little bit out of sync with our weekly Whisk Schedule. Any ways for this week I decided to surpass the Le Cordon Bleu recipe and made my own version of Billy Bi. We do enjoy the recipes in Le Cordn Bleu but seafood especially shellfish needs garlic...lots of garlic! And if I do say so myself, my version of Billy Bi was delicious and we thoroughly enjoyed it. I really wanted to make the Cheese Straws but again I was a bit pressed for time due to the upcoming holiday and so opted to serve the soup with my Fennel Seed Breadsticks which I bake every week so always have a fresh supply at the ready. Recipe adapted from "Le Cordon Bleu at Home"
In a heavy bottomed pot add EVOO and whole garlic cloves. Simmer the garlic until each clove is just soft and golden brown. Remove garlic and mash with a fork. Return garlic to pan and add butter. Add chopped celery and mushrooms and saute for abt 2 minutes. Add the mussels and just simmer until all the mussels have opened. Remove the mussels with tongs and set aside to cool. Sprinkle flour over the celery and make a rue. As soon as flour is well mixed, add the minced basil and wine blending the rue thoroughly. Add chicken stock and heat thoroughly. The mussels should be cool enough to handle and remove the mussels from their shells saving several in shell to garnish the soup. Add the cream and blend. Taste and season with salt and pepper. Serve hot and garnish with the mussels in shell. NOTE: I had about 8 mushrooms that needed to be used so I added them to the soup. Yummy! I have been thinking about making something with mussels soon, it has been too long. Looks so delicious - great choice for bread too! I bet it was great with garlic! Your soup looks really delicious. I love the mushrooms in there, they make it seem extra rich. Your broth looks nice also...when I was reading the ingredients, I thought 8 c of cx stock would make it really thin, but it doesn't look that way at all. It looks rich and delicious. The garlic sounds lovely, we are big lovers of garlic here. Great job...and that bowl is absolutely gorgeous and the perfect serving vessel. You can never have to much garlic. Looks amazing! Mmm, mussel soup sounds delicious!! What a perfect recipe--whether your Whisk Wednesdays are mixed up or not. I'm totally in love with mussels, and I can't wait to try this recipe!